What do Celtic knots, video projectors, the family dog, gondolas, pistols and princess colors have in common? Believe it or not, they've all been incorporated into Hammerton light fixtures at one time or another. As a custom manufacturer, we routinely tackle unique and unusual problems for our clients. Here are a few of our recent favorites. Above & Below: When an Irish client asked us to incorporate a symbol of her ancestral heritage into a lighting package for her U.S. vacation home, our design team settled on the Celtic knot. Note the overlapping detail in the motif at the center of the dining chandelier. Below: A bar light for an aviation enthusiast fabricated from a 1940's J3 Cub propellor, with rawhide shades featuring three different vintage aircraft, all hand-drawn in ink. Below: A buffet light built with a retractable sneeze guard, designed and fabricated for the Watertable restaurant at the Hyatt Regency Resort & Spa in Huntington Beach, CA. Below: A whimsical European-style pendant fit for a princess castle! Several of these fixtures were recently installed at a 'very happy place' in Shanghai, China. Don't let the playful finish colors fool you; they're AAMA-2604-rated outdoor finishes that offer the industry's highest standard for UV and corrosion resistance. Below left: A perfect fixture for the 'pet room', right? This client sent us photos of her labrador to create this realistic drum silhouette. Below right: A modified game room fixture incorporating a client's two favorite sports, skiing and mountain biking. Above & Below: gondolas, big and small! Above right, three of these gondolas, each fabricated to 50% scale, are realistically cable-suspended in a Park City Client backyard overlooking the surrounding ski resorts. Above and Below: While Hammerton's primary business is lighting, clients often ask us to create a wide range of furniture and accessories. Shown here are custom hide-covered barstools with footrests that resemble ski-pole baskets, and deer antler candelabras hand-sculpted from steel. This contemporary lighting design makes a bold statement with a spectacular arrangement of silver branches that reflect the glow from the exquisite copper surround. Artfully portraying the spry energy and delicate curves of plant life, this Chateau light fixture embodies organic movement with an abstract interpretation of nature. A leaf motif amidst rustic textures and colors make for a simple yet beautiful way to bring the outdoors in. Featuring clean lines, graceful curves and a rustic deer design, this fixture can add the perfect amount of texture and charm to a traditional or transitional style living room. 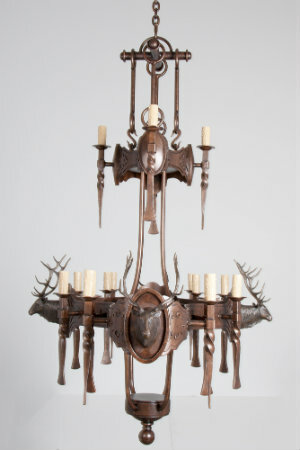 This magnificent chandelier can be used as a sculptural centerpiece that adds the magic of an enchanted forest with its dramatic silhouette and rich texture and detail. This alluring sconce, depicting a texturized oak branch, can add lively interest to any traditional and rustic style interiors. This unique light fixture exudes sophistication with its intricate design that could only be achieved by the hands of an exceptionally skilled metalworker. This contemporary organic design featuring radiating sprigs brilliantly combines natural forms with clean lines and a sleek silhouette. A charming lantern pendant with a leaf motif offers a dash of woodland whimsy. A timeless framework is enlivened by an evergreen scene beautifully backlit by the warm glow of rawhide. 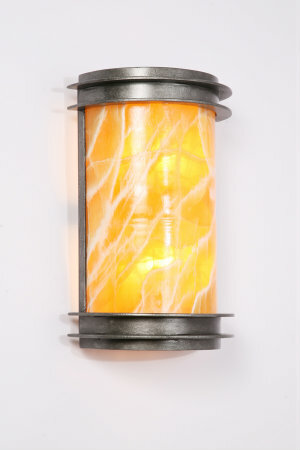 Even modern interiors can be energized with organic designs like this sleek sconce made from honey calcite stone. Its wavelike pattern gives a subtle nod to the natural world. Recreating the likeness of nature’s beauty is not an easy feat… that’s why all of us at Hammerton take great pride in bringing the outdoors in with our organic lighting designs. From rustic fixtures with lifelike branches to contemporary lighting with subtle nods to nature, Hammerton organic light fixtures are carefully crafted to enhance the look and feel of interiors with superior quality materials, realistic textures and striking detail. Our organic lighting designs offer elegance and sophistication from every angle. These dynamic designs depict a variety of motifs, from a rich natural landscape to gorgeous metal taxidermy with lifelike antlers. In addition to drawing the eye, these organic lighting designs feature awe-inspiring craftsmanship and natural motifs that uplift the soul and ignite the imagination. We invite you to browse through the gallery above to view some of our most popular and recent custom organic lighting designs. Contact Hammerton today to learn more about our luxury lighting designs and custom work. 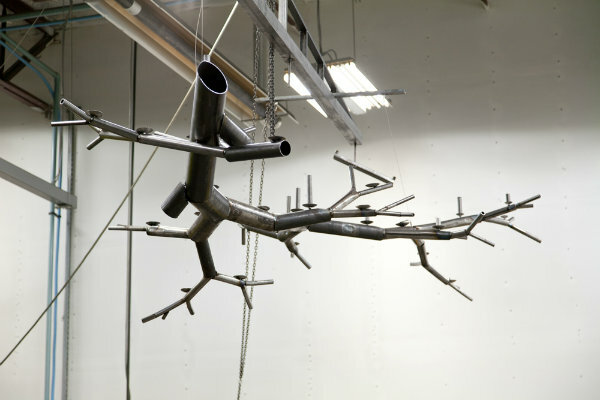 Full-scale drawings of five large branches, each over 8 feet in length, are laid out in the exact space of the steakhouse where the fixture will be suspended from the coffered ceiling above. The branches create a sculptural, wreath-like fixture over 20 feet in diameter. The scaled drawings will help the design team determine how to secure the fixture from above. Selecting the right diameter, length and planar positioning of each structural piece of tube steel is critical to achieving the desired organic characteristics in every 'branch' of the fixture. Little America and the design team at Denton House Design Studio worked closely with Hammerton to create the overall concept and aesthetic elements of each fixture, including brand texture, finish color and lamping specifics. 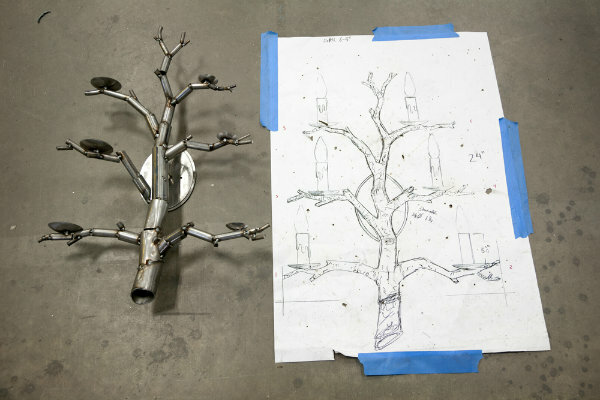 Also in production are custom sconces that will extend the organic branch aesthetic throughout the restaurant. Shown here is the rough structure of the wall sconce next to its original concept drawing. It maybe the dog days of summer, but at Hammerton we’re busy as ever with a number of exciting custom projects slated to ship in the coming weeks. One of the most unusual is a signature centerpiece for the new steakhouse currently undergoing construction at the AAA Four Diamond-rated Little America Hotel in Salt Lake City. Hammerton is thrilled to work with the talented team at Denton House Design Studio to bring this project to life. Over 20 feet in diameter, the fixture will feature five “branches”, each 8 feet in length, interlocked to create a 20-foot diameter wreath-like sculpture that is suspended from the restaurant’s dramatic coffered ceiling. The life-size branches will give the fixture an organic quality, while contemporary elements of color, texture and illumination will create a sleek aesthetic appeal that simultaneously evokes sophisticated elegance and reassuring warmth. 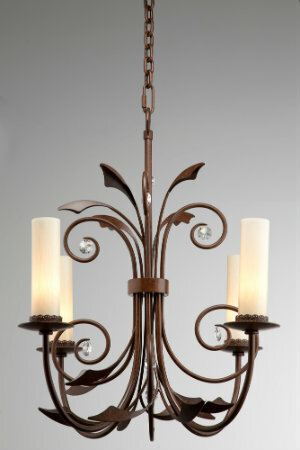 Also in production are several custom sconces that will carry the organic branch motif throughout the restaurant. The Hammerton team has been working closely with designers and project managers from both Denton House and Little America to flesh out all aspects of the project, from concept development and materials selection to finish details and installation logistics. The gallery above provides a snapshot of progress to-date — stay tuned for a look at the final result in the coming months. As background, the Little America Hotel chain is part of a collection of hotel and resort properties owned by the family of the late Robert Earl Holding, who was one of America’s most successful entrepreneurs and largest landowners at the time of his passing in April 2013. The family’s other properties include Little America hotels in Arizona and Wyoming, the Sun Valley Resort in Idaho, the Westgate Hotel in San Diego, the Snowbasin Ski Resort in Huntsville, Utah, and, most recently, The Grand America Hotel in Salt Lake City, which was originally constructed to accommodate attendees of the 2002 Winter Olympic Games and is one of only two AAA Five-Diamond Rated hotels in Utah. We’ll post pictures of the finished installation later this fall. A custom Hammerton drum chandelier with steel details adds an understated touch of masculinity to this ‘rustic-contemporary’ bedroom design. Three staggered Hammerton Seriph pendants create the look of a chandelier in this master bedroom, adding a touch of playful whimsy and a uniquely refreshing style. The strong geometric lines and large scale of this contemporary chandelier are well suited to this master bedrooms' soaring ceiling and stunning view. The lovely tree motif featured on the walls of this bedroom adds a rustic feel that is enhanced by an eye-catching branch chandelier. A delicate crystal chandelier is the "crown jewel" of this classically traditional master bedroom, tastefully decked in stripes and florals. Master bedroom designs often become an afterthought when decorating the home. After all, it seems sensible to place greater attention on more frequented rooms in the home, such as the kitchen and living room. However, the master bedroom is increasingly seen as a design destination where you can kick back and relax in style. In fact, today’s homeowners are now expanding these spaces into master suites, featuring luxurious en-suite bathrooms, functional mini-kitchens and cozy reading rooms. No matter the size of your space, an important element of any master bedroom or bedroom suite design is the lighting plan. For optimum functionality, you should consider everything from general overhead lighting to task lighting and reading lights. While the primary goal is to create different levels of light for day and night, your plan can also incorporate a stylish component to the room’s overall look. Chandeliers are an unexpected choice for master bedrooms that can do ‘double duty’ both for functional overhead lighting as well as for a touch of high style or drama. While the breadth of available chandelier styles offer a good choice of design options, you might also opt for a custom fixture that best fits the scale of your space or speaks to your unique style. You can customize a fixture with forms, materials or textures that add warmth, sophistication or even an element of whimsy. When carefully designed, custom chandeliers make great counterpoints to other bedroom textures, such as bedspreads, shams, carpets, upholstered furniture, wallpaper and more. As with any space in the home, there are some basic design principles to consider when choosing a custom chandelier for a master bedroom. First, keep in mind the style and ceiling characteristics of the room. Bowl-style or other simple chandelier forms are often a good fit for transitional spaces, while more playful or detailed fixtures can add a dash of personality in contemporary rooms. It’s also important to hang chandeliers at least 84 inches above the floor to provide ample space for movement and activity in the room. Take a look at some unique master bedroom fixtures in the gallery of chandeliers above, which also includes a few of our own custom light fixtures. Contact Hammerton today to explore creative custom lighting solutions for your own master bedroom. The original crankshaft light fixture features three wide light-diffusing lenses and an array of circular metal accents arranged around a narrow central base. Very similar to the original, this crankshaft fixture is much larger and features warm-colored lenses along a dark metal base. In this modified version of the crankshaft light fixture, an additional drum was added along the vertical axis. The fixture's smaller drums and lighter color scheme produces an amber glow. 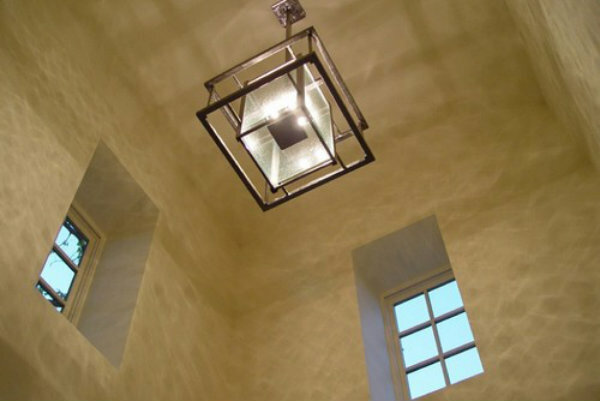 As most Hammerton clients know, we specialize in creating custom light fixtures from scratch. Our custom design process and fabrication capabilities have allowed allow us to craft some very unique fixtures over the years, including this one-of-a-kind fixture which we fondly call the ‘Crankshaft’. A custom cousin to the Hammerton Contemporary Collection, this light fixture was originally designed in 2011 for a Florida home owned by a well-known doctor. 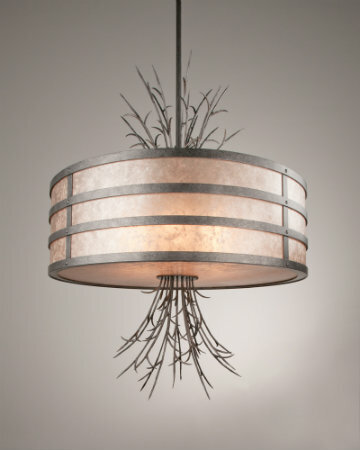 The Crankshaft’s sleek lines make it an ideal design for any transitional or contemporary space. The crankshaft fixture can function either as a chandelier or a vertical drum pendant, so it’s adaptable to a variety of spaces. Many design professionals have incorporated this industrial-inspired piece into client interiors in a variety of incarnations. Some of the ways the crankshaft fixture has been modified include the addition of more drums; changing the colors and finishes of the fixture’s metal base, circular accents and lenses; and scaling the drums up or down along the vertical axis. With our unique capabilities, Hammerton can modify any design to address a client’s aesthetic, functional and scaling needs. Take a look at the ways we’ve customized our iconic crankshaft light fixture in the gallery above, and tell what you think. If you’re looking for a custom lighting solution, contact Hammerton today and we’ll work with you to bring your concept to life. Apothecary pendant chandelier with clear blown glass and a custom finish. Comet pendant chandelier with starlight blown glass and a custom finish. Cosmos pendant chandelier with clear crackle blown glass and a statuary bronze finish. The sleek and contemporary aesthetic of Lightspann’s latest collection of pendant chandeliers beautifully showcases the luminous quality of artisan blown glass. Featured in dozens of stunning designs, this popular material is ideal for a variety of applications – from contemporary or modern homes to hospitality or commercial environments. 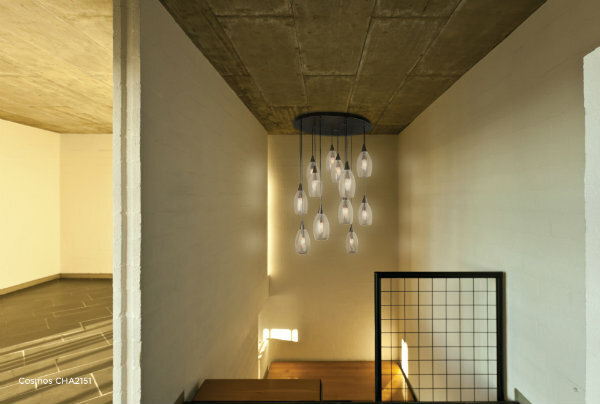 Pendant chandeliers are comprised of several pendants suspended from a single mounting plate. The resulting shape creates an eye-catching, cascading effect with extraordinary decorative properties. Perfect for interiors with high ceilings, pendant chandeliers can add both functional value and aesthetic drama to dining areas, kitchen islands, stairways and entry halls. These new Lightspann designs feature meticulously crafted starlight, crackle and clear artisan glass, and offer a choice of 14 finishes. Each can be easily scaled or customized to accommodate a particular space or function. Make one of these luxurious designs a focal point in your home! Call your Lightspann representative today to learn more. A row of contemporary light fixtures adds both functionality and aesthetic appeal to long, dark entryways. A light fixture crafted from complementary materials can create a dynamic and luxurious look for formal entryways. This clean and spare drum shade elegantly conceals its light source to exude a warm and inviting glow. A lashed rawhide chandelier from Hammerton's Log & Timber Collection adds a splash of personality to this home's rustic interior decor. Since so many homes today have casual side entrances, it is easy to overlook your formal entryway décor. However, it’s important to keep in mind that the entry is the first area guests see when they visit your home, so overall design and atmosphere will affect first impressions. And as we all know, first impressions count! Since the space in your entry is often limited, a central light fixture often provides the best opportunity to set the aesthetic tone for your home and reflect your unique personality. Drum Roll: What’s more versatile than a drum shade pendant? You can even add a diffuser to soften the light for a more luminous glow. A customized drum that incorporates a delightful pattern or decorative accents will surprise guests with a splash of personality and enhance your foyer’s interior design. Consider Various Materials: Add a touch of unexpected luxury to your entryway by using unconventional materials for your light fixture. 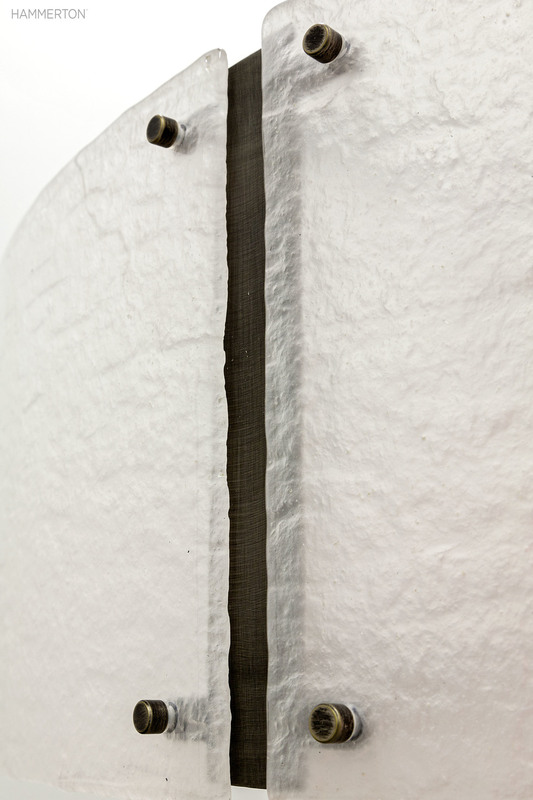 At Hammerton, we craft fixtures from a wide range of rich materials including polished steel, textured glass, mesh, mica, parchments, organic eco-resins, wood, acrylics, textiles, lashed rawhide and semi-precious stones. Double (or even Triple) Up: If your entryway is long, narrow and tall, you might consider installing a row of large pendants to evenly light the space and add some drama. Or consider grouping several smaller pendants at staggered heights to provide an interesting alternative to a traditional chandelier. A combination of pendants, sconces and table lighting is also an effective way to add layers of light to your entry and provide some lighting flexibility. Consider Architectural Details: Let your home’s architectural style help determine the style of your entry fixture. Both exterior and interior architectural details can influence your decision. For example, if your home features a rustic, mountain style, a dark mica chandelier with an antique iron finish from our Log & Timber Collection can help create a cohesive look. Adorning your entryway with the perfect light fixture can be a difficult task without some element of customization to get the look and scale just right. At Hammerton, we routinely modify fixtures from our catalog to coordinate with our clients’ décor. 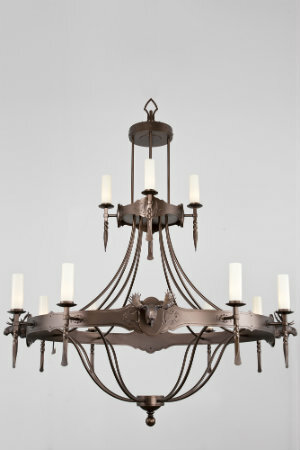 Or we can work with you to design a completely unique entry fixture from scratch. Contact us today!